Why investors' eyes will be on Apple, Restoration Hardware, and Kroger over the next few trading days. 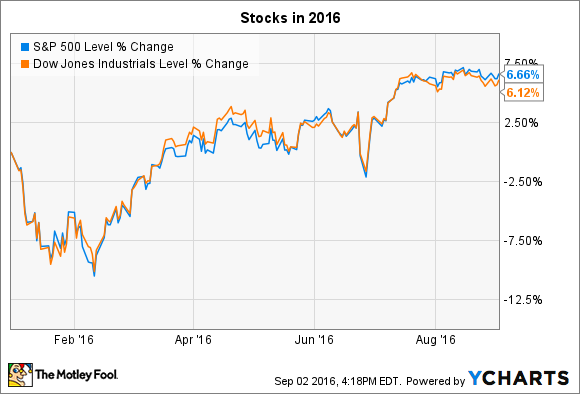 Stocks rose slightly last week. The Dow Jones Industrial Average (DJINDICES:^DJI) and the S&P 500 (SNPINDEX:^GSPC) each added roughly 0.5% to stick at over 6% gains so far for the year. The trading week ahead is shortened, with markets closed on Monday. However, the remaining four days are packed with news that could spark big moves in stocks. Apple (NASDAQ:AAPL), which is responsible for a disproportionate segment of the entire market's earnings, will talk about its new product plans first. Then, Restoration Hardware (NYSE:RH), and Kroger (NYSE:KR)will grab the spotlight with their quarterly earnings reports later in the week. Apple is holding a highly anticipated product launch event on Wednesday, where it's a safe bet that the tech giant unveils new iPhone models, likely dubbed the iPhone 7 and iPhone 7 Plus. Rumors have it that CEO Tim Cook and his executive team are adding some flashy new features, including a pressure-sensitive home button and standard wireless headphones, in addition to the traditional processor and display upgrades. Investors are hoping the refreshed lineup will help Apple return to growth in its biggest business after several quarters of declines. The popular iPhone SE might get an upgrade this week. Image source: Apple. Additionally, the company could show off an upgraded Apple Watch this week that aims to move that product into a more significant profit driver. The services segment, which has soared to 11% of sales from 8%, might just garner the most stage time, though, with software updates including on iPhone and iPad operating systems . With its stock down 60% over the last twelve months, expectations are low heading into Restoration Hardware's quarterly release this week. The luxury furniture specialist's earnings are seen plunging by 66% because of costly production delays around its RH Modern concept. Consensus estimates also have sales rising by just 1% in a further slowdown from last quarter's 8% improvement . RH's shareholders will be looking for clarity around whether the retailer's move away from a promotional sales model into a membership focus is the right long-term strategy. Sales and traffic growth, along with gross profit margin figures, should provide answers there. At the same time, investors are hoping to see continued progress at building out its online presence and putting together a holiday product lineup that resonates with customers. Supermarket giant Kroger posts its quarterly earnings results before the market opens on Friday. Investors have soured on the stock lately as revenue growth slowed to a crawl. Comparable-store sales had been rising by over 5% for more than a year before dropping to a 4% rate two quarters ago and slumping to a 2% pace last quarter. Kroger's sales growth pace. Data source: Kroger financial filings. Yet that decline has more to do with food cost deflation than competitive pressures. Kroger's operating margin and sales volumes both improved last quarter, in fact. Meanwhile, the grocery chain's profits are growing at a healthy pace, even slightly above the 8% to 11% long-term target that CEO Rodney McMullen and his team have staked out. That implies the retailer should manage its 11th straight year of market share gains in 2016, even if its rate of growth isn't quite as impressive as it was last year. Ultimately, investors should look for Kroger to post its 51st consecutive quarter of positive comps on Friday despite an unusually weak grocery pricing environment.